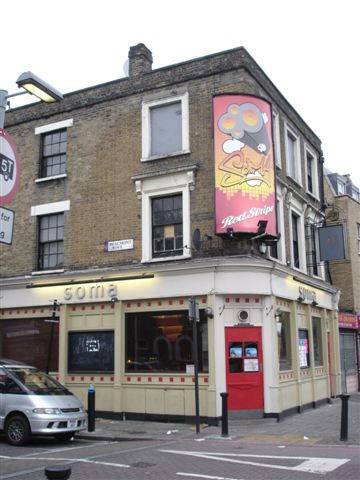 At 35 Hayfield Place, Mile End Road in 1856, near the intersection with Beaumont Street; This pub closed in November 2007, having traded as Soma in its final years. ** Now a kebab shop (2014). 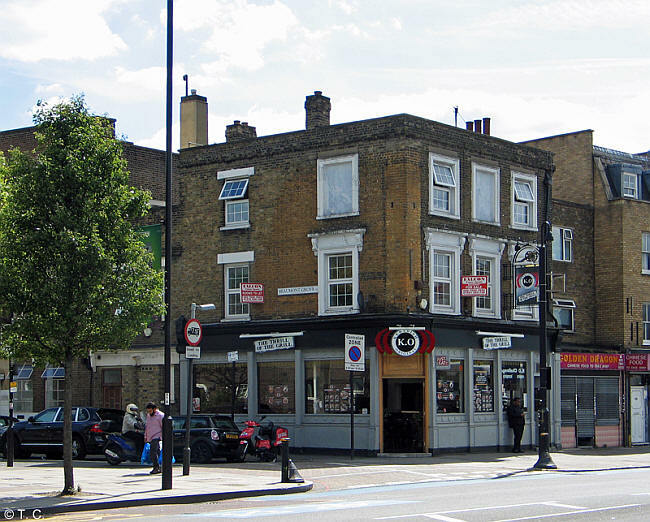 *+ The Kings Arms disappears from the Mile end road street directory in 1842, and the next entry I can find is in the 1973 BT Telephone directory listing. It is possible it reopens as a pub sometime in the period. The early records of Thomas Hemingway suggest the Kings Arms was in existence from about 1832. His records also list his licensing prior to this at the Waevers Arms etc. back as far as 1815; all courtesy of the National Archives, or 'access to archives' as I prefer to call it. Actually, looking at the 1832 London street directory for Mile end road where I suggest the Weavers Arms should read the Kings Arms, suggests that they are the same pub?? It looks very much like this if you compare this with the 1842 directory listing. The description placing it opposite Globe road also maps this correctly as the Weavers Arms, later the Kings Arms, confirming the existence of this pub back as far as 1823. A listing of historical public houses, Taverns, Inns, Beer Houses and Hotels in Mile end, London. 26 August 1783, Thomas Hemingway, aged 27 days, is baptised at Christ Church, Spitalfields, son of Daniel Hemingway, a butcher, North street, and Ann Hemingway. On 10 January 1827, aged 43, he is a member of the Mount Moriah Lodge of Freemasons until at least 1829, and listed as an inn keeper of Mile End road. There is a marriage in St Botolph in 1815 between Thomas Hemingway and Elizabeth Kerr. I have Thomas Hemingways' death record and burial details - died Worthing 1856, aged 72, and buried in the London & Tower Hamlets Cemetery in February 1856; in the family grave purchased, when his son William died. His son, Thomas II, must have taken over when the lease on the Bank Friendship (1841 for 21 years) expired in 1862. He died in 1869 and his sister Mary Ann took over in 1869. The Kate Hemingway (1869 Proceeds of the Old Bailey) was the daughter of Thomas II and Mary Jane (nee Dredge). I am not sure who the Mrs Hemingway 1870 is it could be Thomas’ I wife Elizabeth who died in 1873 or Mary Jane wife of Thomas II, both were widows at that time. Mrs M. J. Hemingway is Mary Jane the wife of Thomas II She was there until 1882 according to your records. I have found her death which occurring to the probate records on "3rd July 1881 at the Bank of Friendship, Public House, Hartford Street, Mile End Road”.